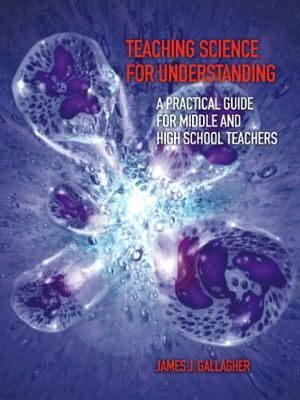 Teaching Science for Understanding, 1/e Written by the leading science educator in the country, Teaching Science for Understanding challenges you to transform your ideas about teaching from passive, direct learning to active, inquiry learning. To do so, the author demonstrates science teaching through three different levels of learning activities: building students base of information developing understanding applying knowledge Each chapter guides you through the type of planning and instruction you will need to create a constructivist environment in your classroom, providing you with specific activities and examples to illustrate how you can teach science for understanding. Unique Features: Science Reform Identifies the four major elements of a new vision for science education; science for all, teaching and learning for understanding, a broader vision of science, and a reduction of the amount of science content offered in middle and secondary school teaching. Supporting these elements are Project 2061, Science for All Americans, National Science Standards and No Child Left Behind. Active Learning promotes students engaged in constructing their own learning and assists teachers in knowing their role in deciding when to withhold help, when to give help, and what help to give. Instructional Model for Teaching Science for Understanding shares a design for planning objectives, ongoing assessment and learning activities through a sample lesson on photosynthesis. Excerpts from best-selling Middle School and Secondary Textbooks and Teacher Guides Appearing in Chapters 10-14, explicit examples of textbook pages and teacher guides illustrate how teachers can use textbooks as enrichment, background knowledge and resources as a part of teaching science for understanding.Gallagher, James J. is the author of 'Teaching Science For Understanding A Practical Guide For Middle And High School Teachers', published 2006 under ISBN 9780131144255 and ISBN 0131144251.